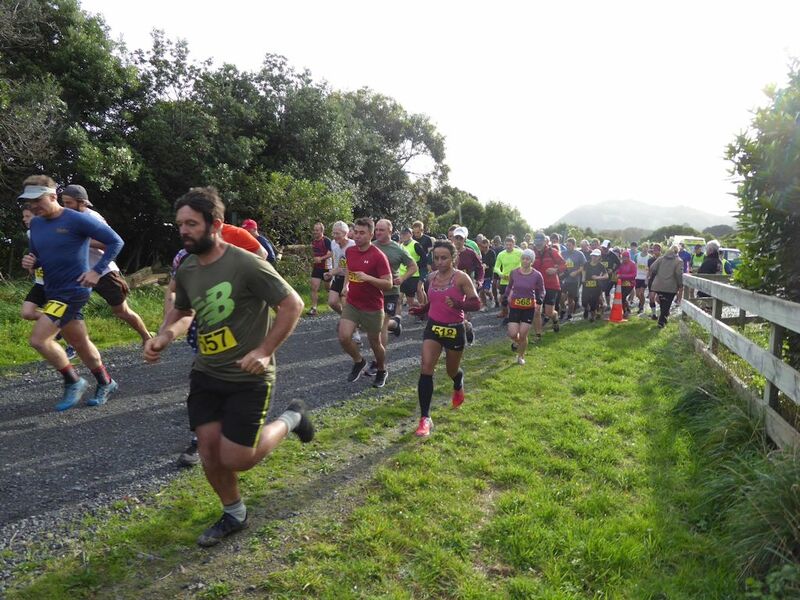 Preparations are well underway for the eighth running of the Kapiti Joggers and Walkers In the Footsteps of the Marines charity event on Sunday 26 May 2019. Last year more than 140 walkers and runners participated, including several Marines and US Embassy staff. In 2018, because of uncertainty over the availability of Waterfall Road, the event courses were entirely in Whareroa Farm and on Campbell’s Mill Road. These off-road courses proved popular with competitors and will feature again this year. In the Footsteps of the Marines provides a unique opportunity to run or walk in the hill country behind Camp Mackay, where the Marines trained in 1942–1943. The courses include unsealed roads; bush, shingle and clay tracks; and farm roads. The route climbs over 300 metres and the high points offer spectacular views of the Kapiti Coast. However, it is manageable for anyone with reasonable level of fitness. Starting on the seaward side of the Whareroa Farm shelter, the course takes competitors towards the hills along a farm road, then on winding tracks up to Campbell’s Mill Road. Competitors then head north along the unsealed road. The short course for Social Walkers and Slow Joggers turns around at the saddle, while the Race Walkers and Runners’ long course continues on to the intersection of the Maungakotukutuku Hill Road and Campbell’s Mill Road and return the same way. On both courses, participants come back to the entrance into Whareroa Farm. The descent through the farm follows a short bush trail and onto a zigzag track. More tracks and an unsealed farm road then take all competitors to the finish beside the Whareroa Shelter. The race is restricted to people 12 years and over, unless accompanied by an adult. The headquarters for the event is the Whareroa Farm Shelter, MacKays Crossing, north of Paekakariki. Race Walkers, Social Walkers and Slow Joggers start at 9.30 am, and Runners at 10 am. There are plenty of spot prizes, kindly donated by local businesses. After the race, competitors can enjoy a cup of hot soup and a roll, and pick up their finisher’s certificate at the Ramaroa Centre in Queen Elizabeth Park. The entry fee is $30 with an extra $5 for late entries on the day available from 8.15am. Participants can post their entry or enter online at: http://www.enteronline.co.nz Entries are now open. It is one of the best value for money events in the country. Donations will be made to a range of local charities and groups. Last year over $2000 was disbursed. The event is generously sponsored by Pak’nSave, The Print Room and CityFitness. For more information e-mail: jill.hammonds@gmail.com or johnerg@gmail.com (John Granville).